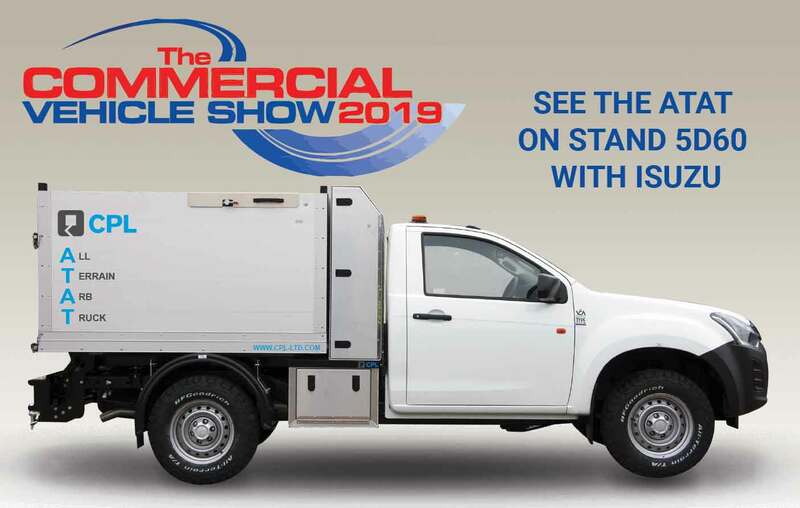 CPL will exhibit the market leading All Terrain Arb Tipper (ATAT) at the CV show 2019 on Isuzu stand 5D60. Come on stand and discover the amazing features this Arb truck has to offer. With a 3.5t Suspension upgrade this All terrain arb tipper Isuzu D-max conversion can hold up to 1300Kg of chippings, logs or refuse. The Fully type approved Isuzu conversion can come in different variants from Tipper to a drop-side or flat bed versions. Our conversions come with a steel frame for robustness and are fully powder coated to add extra strength. The tipper variants have a maximum tipper angle of 50 degrees to aid in tipping loads and uses an up rated four pivot point tipper cylinder mechanism. This will give years of use without over stressing the frame or the chassis. For the Arborist, the Isuzu Chipper Tipper Truck comes with a full aluminium body and drop down tailgate. For refuse/waste collection it is fitted with half mesh sides. And for more general usage there is the option of a drop side conversion. All conversions can be fitted with or without a fully secure aluminium toolbox behind the vehicle cab. Which can be anodized in a number of colour’s to suit your company. There is also the option of a 10Kg side locker for a First Aid kit or 50/50 can. The CV Show is free entry and takes place from 30th April – 2nd May 2019 at the NEC Birmingham.